Since the cafe has been closed this week, I have enjoyed being at home, catching up on the back office side of ToastLoveCoffee, and baking. Since the MacMillan coffee morning campaign is in full flow, I had some serious batches of flapjacks and other goodies to make for my husband, sister in law, and of course for our very own coffee morning on Wednesday (please come!). Inspired by a TLC friend and health guru, Natalie (check out her Facebook page https://www.facebook.com/Leeds8/ ), I decided to try some sugar free baking. Needless to say, it was a bit of a disaster. Firstly, the oranges and lemon (yes I threw that in too) boiled dry so when I went to check on them there was a massive burnt patch on the bottom of the pan that I’m still trying to scrape off. Secondly, sugar free baking is, it turns out, more complicated than simply omitting the sugar. Funny that! And the eggs basically made it into a pancake. So, there you have it; two bitter, eggy, dry pancakes in cake tins. Oh dear. I had to call Natalie anyway (about the MacMillan coffee morning – she’s organising it and it’s going to be fab!) and so I berated her for inspiring me to try making a sugar free orange cake. She laughed along with me as I described, step by step, what I’d done. She suggested I try melting some dark chocolate (OK, admittedly not sugar free, but it NEEDS sweetness! ), and crumbling the bitter orange pancake cake into it, making a kind of moist, orange chocolate truffle. And you know what, I did. 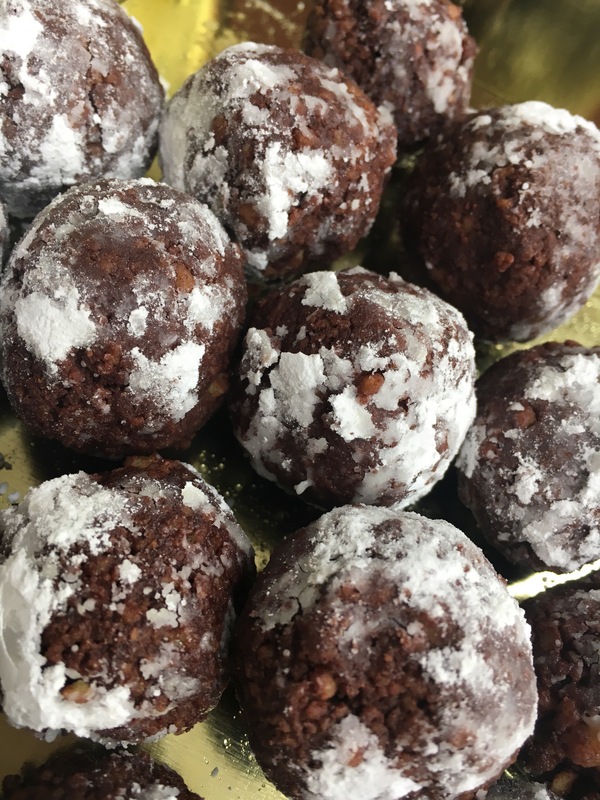 And I’ve rolled them each in a bit of icing sugar too (remembered from my childhood making chocolate truffles with my mum for Passover). And they’re delicious! Thank you Natalie – I’m sorry I ever doubted you! And the moral to this tale: When God gives you lemons, make lemonade. When God gives you oranges, a lemon and egg, add dark chocolate and make something yummy??? whatever, they’ll be great with coffee on Wednesday- save some for me!